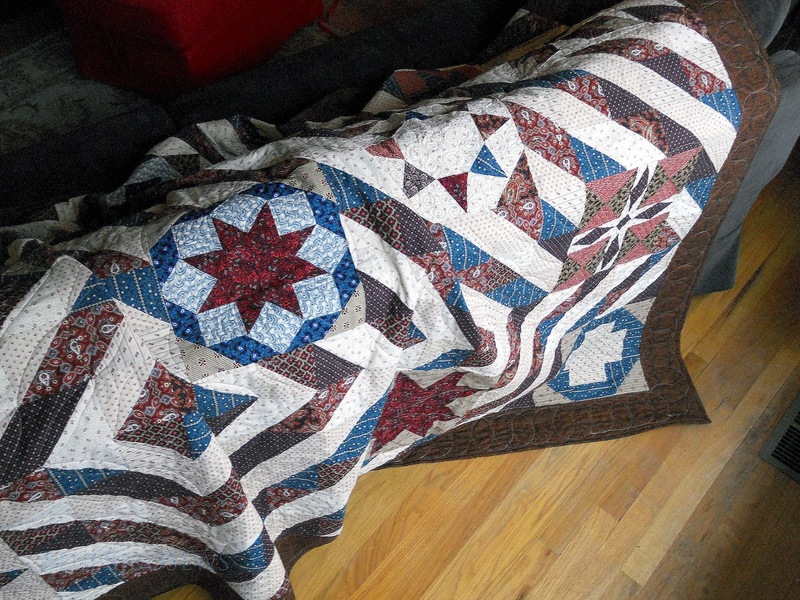 Great quilt feature today from Kelly of Blue Bird Sews. The Galaxy Quilt is such a cool design made for a manly man! Some good ideas and tips! She shares some of the process here and here. 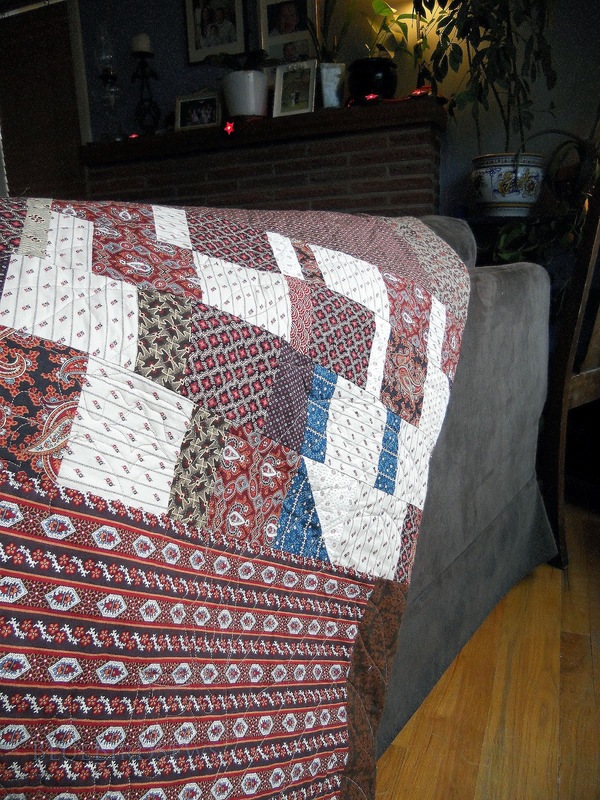 Kelly has a great list of tutorials, including some cool quilting ones I'd like to check out! For some handmade goods check out her shop and for more inspiration see her flickr. Thanks Kelly! So this post has been in the works for quite some time now. Early last year my friend J and I started talking about a quilt for his bed. Only a few requirements: no flowers, dark man colors and it had to fit onto a queen sized bed. With those parameters I set out to make an epic man quilt; Nailed It! The design part of Galaxy took a lot of thought. I knew it needed a bold geometric foundation...as this is a man quilt! The offset squares in dark/light values make a dynamic backdrop for 12" sampler blocks made from the 2011 Summer Sampler Series. I can't recommend this sampler series enough! Excellent directions and beautiful results. I could see myself making all these blocks over and over again. 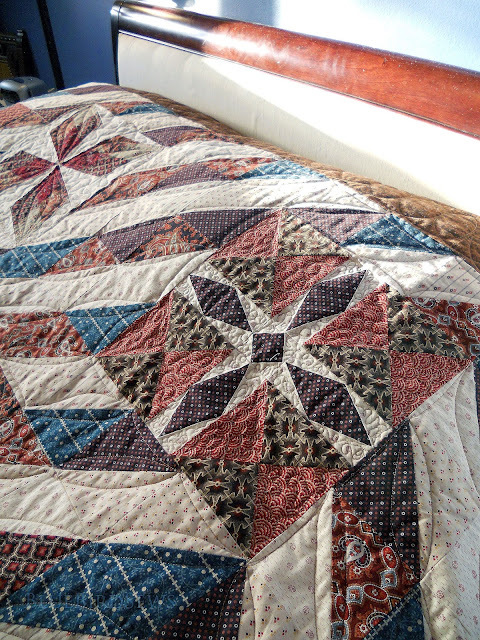 After making the six pointed string star block I felt like I could sew anything. The Minnesota block ended up being one of my favorites. I just love the way the colors and shapes play off each other. Galaxy measures a whopping 90" x 88" and was quilted on a long arm by me. 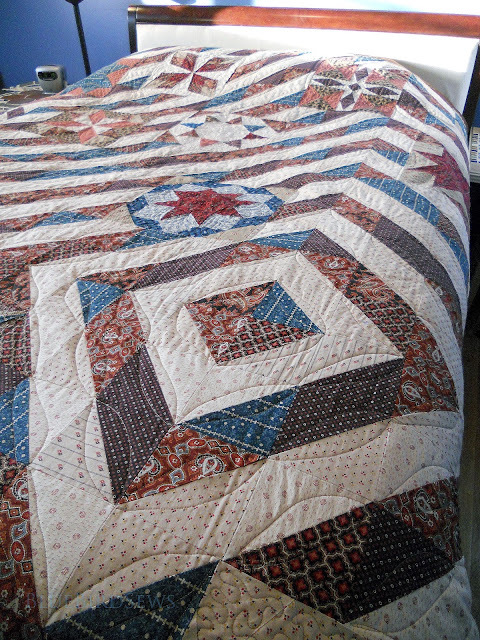 It was the 4th quilt I have quilted on the long arm and by far the most challenging. I sewed corner to corner on the dark/light background and then for the blocks did more detailed quilting to make an impact on each design. My best trick with the quilting details was to make a statement by not quilting some areas and heavily quilting others. This made for some cool effects. The back of the quilt is completely pieced together with left over yardage. I had bought a lot of different colors and patterns and used up the ones with little flowers on the back. There was also a happy accident that made the back even more stunning. I had originally planned for a pieced scrappy boarder on the front but once it was on it just didn't work. So I decided to sew them up and use it on the back...as it turned out it was the exact width I needed. Amazing how things come together sometimes. The way the quilt lies on a bed is magical. There is no way I could have known that the blocks would lie across the top pillows so perfectly, or that the center square would radiate so nicely from the bottom corner of the bed or that the blocks seem to burst out of the center gradually until becoming heavy on the outside. These are all wonderful coincidences that make me happy. What a beatutiful quilt, it's fantastic. I really love it. Beautiful quilt. I really love the way it looks on the bottom corner. Great job. It is a wonderful quilt, and maybe a bit of serendipity on placement, but very manly and beautiful! Thanks for the wonderful comments everyone! And to Heather and Megan for making the story shine! Cheers! What a great "man quilt".